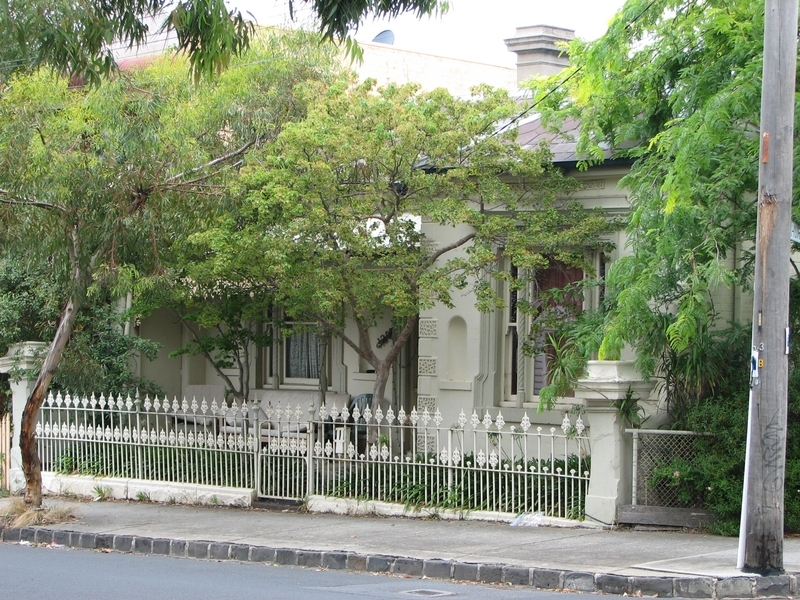 The Italianate Victorian style villa at 120 Stewart Street, Brunswick was built at the height of Melbourne's boom period, in 1887. The first owner of the single-storey, double-fronted, eight-roomed brick house was Cornelius Crow. He was possibly a tradesman highly skilled in interior decoration, or had a close association with Brunswick's building contractors. This clue to Crow's identity can be found in the formal front room on the east side of the house. Here in this space of rather modest proportion, is an unusually ornate painted and plastered, coved ceiling featuring seascape and mountain scenes. In the corner of the painted panel above the door can be distinguished the initials 'CC'. Across the hall, the corresponding front room is more ornately decorated with another six painted panels surrounded by intricate plaster mouldings covered in gold leaf. One of the most interesting of these scenes is the very recognisable view of Melbourne's Government House showing its distinctive tower from across the lagoons of the Botanic Gardens. In 1888 Crow sold the villa to local contractor, David Morgan, who may have been the builder for this house a year earlier. The house remained in the Morgan family until the 1970s, after being occupied by a number of tenants. The house at 120 Stewart Street is of aesthetic and historic significance to the State of Victoria. The house is aesthetically important for its decorated interior which is remarkably ornate for a domestic building of this size, and reflects the late nineteenth century preoccupation with elaborate finishes more usually associated with grander residences. The decorative scheme in the parlour (now lounge) with its coved plaster ceiling, ornate plaster mouldings covered in gold leaf, six landscape panels, and green painted finish, is exceptionally detailed and intact above the cornice line, and is representative of the skill, knowledge and spirit of late Victorian decorators and designs. The scheme in the bedroom, also decorated with six landscape panels, is less embellished, but shows the same degree of skill. The painted scenes are significant for their artistic qualities as well as for their potential to yield information on their locations which appear to be 'postcard' views of travel destinations, notably Melbourne's Botanic Gardens and Government House, and the well-known nineteenth-century view to Hobart and Mt Wellington from Bellerive. The lower walls of these rooms, and the more simply decorated entrance hall have been painted over, but importantly have the potential to reveal more of the original scheme underneath the surface. The interior is historically important for its associations with Melbourne's lively, late nineteenth-century network of highly skilled crafts and tradesmen, amongst whom the artist and first owner of this house, Cornelius Crow, can be included. 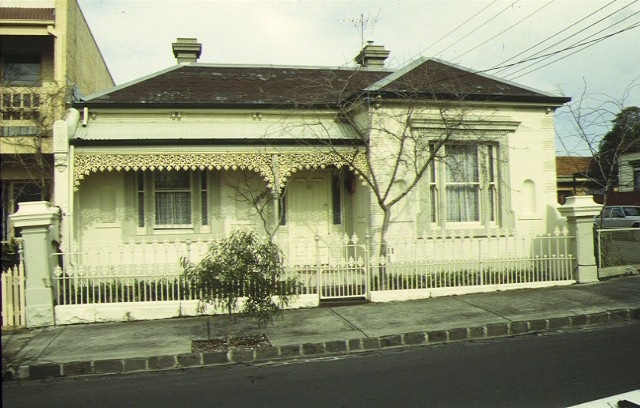 House, 120 Stewart Street, Brunswick, Moreland City Council. 1. 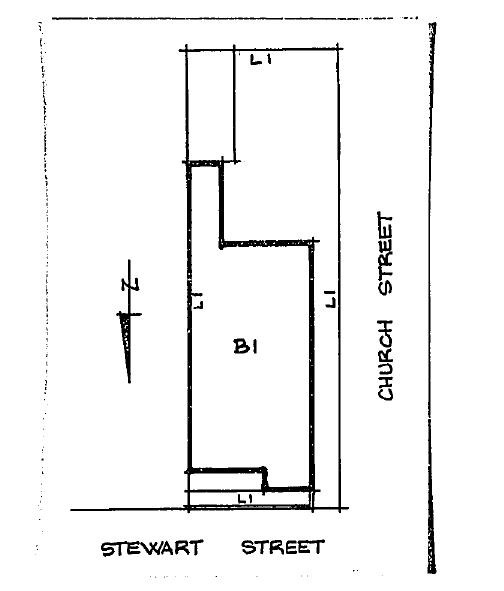 All of the building, including the iron palisade front fence marked B1 on Diagram 606304 held by the Executive Director, Heritage Council. 2. All of the land marked L1 on Diagram 606304 held by the Executive Director, Heritage Council, being all of the land described in Certificate of Title Volume 8524, Folio 362. Much of Brunswick was grazing land between the 1850s and 1880s. William Lobb of Lobb’s Lane, now known as Stewart Street, grazed cattle on his farm from about 1843 and he or perhaps his son was still there in the 1880s. By this decade much of Stewart Street was changing from substantial farming allotments to smaller suburban blocks. These boom years saw older stone farm structures gradually give way to speculator-built Italianate villas and cottages, and Stewart Street, like many newly subdivided parts of Brunswick, began to attract an assortment of skilled and semi-skilled worker residents. In the late 1880s the small farming community in Stewart Street had been joined by a grocer, bootmaker, storeman, quarryman, labourer, clerks, contractors, an engineer, and a gentleman. Some undeveloped land was leased by Chinese market gardeners, Quan Long being the first market gardener in the street in 1885, renting the land from Thomas Gray. He maintained the garden on the corner of Church Street (formerly Crowe Street) until 1923. A large population of tradesmen had traditionally lived in Brunswick. They initially settled in the area when the clay industry commenced its rapid growth in the 1840s and 1850s making bricks, tiles, pipes, domestic stoneware and earthenware. Many found work in other allied industries that were increasingly attracted to the area from the 1860s, and a lively craft network of highly skilled workers began to flourish in the suburb. A Mechanics Institute, which opened in 1868, was constructed by local tradesmen using bricks made in Brunswick, and this building became the focus for a much-needed educational facility, providing reference books for locally subscribing workers. By 1873 it had 1150 titles. Questions of style, form, ornament and colour were pondered seriously by crafts and tradesmen throughout the Victorian era, and while the need for ornament was accepted more or less by all, its precise application was a matter for debate. Publications abounded on taste, ornament and decoration, many of which were undoubtedly made available in mechanics institute libraries. The Italianate villa at 120 Stewart Street, on the south-east corner of Church Street (formerly Crowe Street) was built in 1887. It is one of a small group of houses erected over two years in this part of the street and may have resulted from the ‘Carlton Estate’ subdivision. The first owner of this eight-roomed brick house and stable was Cornelius Crow. Unfortunately the ratebook for this year does not list Crow’s occupation, but does list those of his neighbours. He was possibly a tradesman specialising in interior decoration, or had a close association with Brunswick’s building contractors. This clue to Crow’s identity can be found in the formal front room on the east side of the house. Here, in this space of rather modest dimension, is an unusually ornate painted and plastered, coved ceiling featuring seascape and mountain scenes. In the corner of the painted panel above the door can be distinguished the initials ‘C.C’. It seems Crow painted the murals in his hand, indicating that he may have been a trade painter, a skilled amateur, or he may even have had some connection with the sea. Several scenes appear to be ‘postcard’ views of Hobart, and possibly New Zealand landscapes. Perhaps Crow visited these places, or copied the images from illustrations or photos. Across the central hall, the corresponding front room is more ornately decorated with another six painted panels surrounded by intricate plaster mouldings covered in gold-leaf. A signature has not been found on these works although they appear to be by the same hand and feature another collection of ‘postcard’ views. One of the most interesting of these scenes is the very recognisable view of Melbourne’s Government House showing its distinctive tower from across the lagoons of the Botanic Gardens. Another panel has a rural landscape featuring a timber squatter’s cottage. Side by side we see two views of the colony: the cultured, contemporary, ‘empire-city’ of gardens and vice-regal architecture, beside the idealised squatter’s hut, a nostalgic reminder of the colony’s humble bush past. Increasingly from the 1860s, popular art forms such as cheap prints and panoramas of noted travel destinations appeared in local tourist guides and newspaper features, and were equally successful in disseminating information about Australia for potential immigrants. Artist, W. C. Piguenit painted mountainous scenes of Tasmania and hoped that they would be attractive to the tourist. One of the painted panels in the Stewart Street house reproduces the popular nineteenth-century scene of the view to Hobart and Mount Wellington from Bellerive. Another artist, Nicholas Chevalier was commissioned by the provincial government of the South Island of New Zealand to ‘spread the fame of New Zealand through his pencil’. His sketches were frequently engraved in the Melbourne illustrated newspapers. The link with local trades and industry is further illustrated in the iron palisade front fence made by Bowen Brothers and Langshaw of Brunswick. The ostentatious, almost over-sized cornice and ceiling mouldings are unusual for a house of this scale and also suggest a local trade connection. By 1888, two single-fronted, five-roomed houses were constructed around the corner in Crowe Street by local builder David Morgan. Each displays the features that characterise Crow’s house, such as the elaborate front facade mouldings and niches, pointing to the supposition that Morgan may also have been the builder for the villa at 120 Stewart Street. During the same year Cornelius Crow sold the villa to builder David Morgan who was by then the owner of four houses in the Stewart Street vicinity. The house remained in the Morgan family until the 1970s, after being occupied by a number of tenants. Interior painting and wall-papering to walls and ceilings of all areas except the two front rooms containing the ceiling murals and the front hall, provided the preparation work does not remove evidence of the building's original paint or other decorative scheme. Refurbishment of bathroom /toilet / ensuites including removal of existing sanitary fixtures and associated piping, mirrors, and wall and floor coverings, and installation of new fixtures, and wall and floor coverings. Removal of existing kitchen benches and fixtures (stoves, dishwashers etc.) and floor coverings and installation of new kitchen benches and fixtures, including associated plumbing and wiring. Installation of hydronic, or concealed radiant (Ceiling Foil Radiant Heating or under carpet heating) type heating, provided that the installation does not damage existing skirtings, architraves and the location of the heating unit (boiler etc) is concealed from view. Re-wiring provided that all new wiring is fully concealed and any original light switches, pull cords, or GPO's are retained in-situ. If wiring is original to the building, timber conduits should be left in situ rather than removed. Installation of hooks, nails and other devices for the hanging of paintings, mirrors, and other wall-mounted works of art. Installation of electronic security system, including required wiring and fittings. Installation of locks on doors and windows. Replacement of Church Street frontage fencing. Installation of missing fleur-de-lis spearheads to the Stewart Street palisade fence.